Two million years ago in South Africa, part-human and part-ape-like individuals existed — and now we know what they looked like and how they behaved: They had a primitive, pigeon-toed gait, human-like front teeth, ate mostly veggies and spent a lot of time swinging in the trees. The species, Australopithecus sediba, is a striking example of human evolution, conclude six papers published in the journal Science. Taken together, the papers describe how Au. sediba looked, walked, chewed and moved. "Sediba shows a strange mix of primitive australopithecine traits and derived Homo traits — face and anterior dentition like Homo, shape of the cranium like Homo, other parts of the face and size of the cranium like an australopithecine, arms like an australopithecine, pelvis and lower limbs like Homo and feet and ankles like an australopithecine," project leader Lee Berger told Discovery News. "It does look like a good 'transitional' fossil, doesn't it?" added Berger, who is a researcher in the Wits Evolutionary Studies Institute at the University of the Witwatersrand. He named the species, which was found at a site called Malapa, near Johannesburg. "All of the research so far shows that sediba had a mosaic of primitive traits and newer traits that suggest it was a bridge between earlier australopiths and the first humans," said Debbie Guatelli-Steinberg, co-author of one of the studies and a professor of anthropology at Ohio State University. Peter Schmid of the University of Zurich, who also analyzed this species' remains, shared that the early probable ancestor was not a carnivore. "Microscopic elements of plants were found in the tartar of the teeth of Au. sediba," Schmid told Discovery News. "It was largely a vegetarian and shows a rather human-like chewing apparatus." In terms of how it walked, Schmid and the other researchers explained that Au. sediba had a small heel resembling that of a chimp. It walked rather awkwardly — with an inward rotation of the knee and hip, with its feet slightly twisted. The scientists conclude that this pigeon-toed way of walking on two limbs might have been an evolutionary compromise between walking upright and tree climbing. Boston University's Jeremy DeSilva, a functional morphologist and expert on Australopithecine locomotion, discusses Au. sediba's gait. DeSilva is lead author on the paper that explores the species' lower limb anatomy. Such a detailed understanding of these movements is possible because remains for a female Au. sediba preserve her heel, ankle, knee, hip and lower back. In contrast, the famous "Lucy" skeleton, representative of the species Au. afarensis, only preserves a hip and ankle. Yet another new study analyzed Au. sediba's upper limbs. They were "primitive," meaning more like those of an ape, suggesting that these individuals still spent some time swinging and climbing in trees. "The terrestrial adaptation was much more evolved, but there are indications that it had still a large part of climbing in its locomotor spectrum," Schmid explained. The case isn't closed yet, however, as still other researchers believe that additional australopithecines, such as Lucy, gave rise to our ancestors. Lucy's species has only been found in northern Africa so far. This article originally appeared at Discovery News, and has been republished with permission. 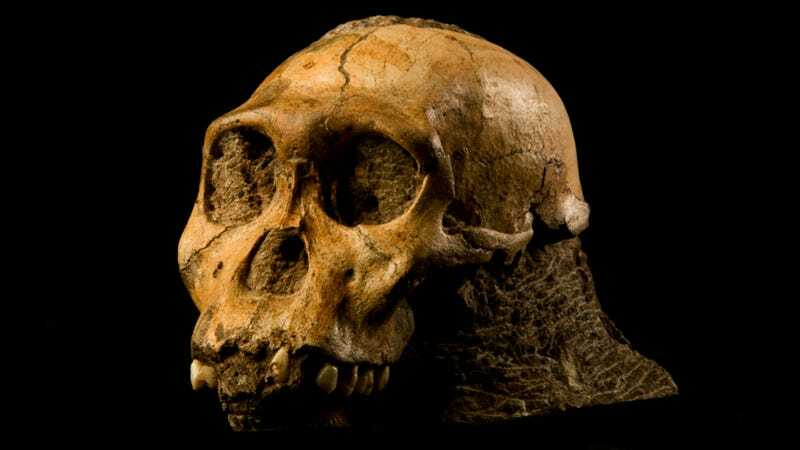 It has been supplemented with media relevant to the package of papers on Australopithecus sediba by Dr. Berger, Dr. Irish, Dr. de Ruiter, Dr. Churchill, Dr. Schmid, Dr. Williams, Dr. DeSilva, and colleagues.